The weather was cold, there was frost on the windowpane, and the sounds of sneezing and coughing could be heard through the house. We were in the throes of a blustery Michigan winter. Now, for anyone who lives in the Midwest you probably know how frigid and wild the winter weather can be. On top of being freezing cold, winter in the Midwest is also peak cold and flu season. Many folks think that the cold itself makes you sick, but it is actually being cooped up indoors with other people that makes you catch an illness. I have never been one to believe in the flu shot nor do I give the injection to my children. Now, if you enjoy the flu vaccine, that’s fine and dandy. You do you. However, I’ll do me and stay far away from the stuff. So, the weather was cold, and the kids were all sick. I was giving them elderberry like nobody’s business but for some reason it just wasn’t kicking the cold bugs out of their system. 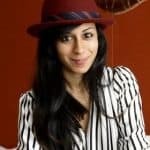 I called my best friend, who is an herbalist, and picked her brain for natural solutions. She had mentioned “bone broth” to me. I was like, “bone broth”? What in the world was that? It sounded like something out of a horror movie. Come to find out, the stuff is quite magical. 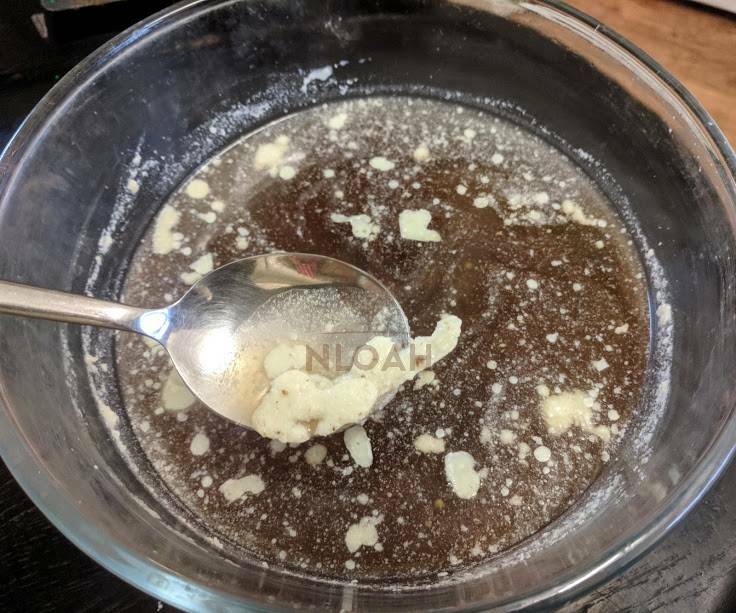 My friend told me that making bone broth and preserving it is easy and she’d been doing it for quite some time. I asked her how bone broth could help my family fight off the cold and flu bugs and she explained to me that it is full of gut healing properties. When our guts aren’t healthy, we aren’t health as 60% of our immune response resides there. Plus, bone broth is packed with nourishing electrolytes that keep us from becoming dehydrated and being well “watered” is wonderful for getting rid of an illness. I never worried whether my kiddos would like bone broth or not because it is basically soup. A super-charged magically soup, but soup, nonetheless. After I made it I put it into their favorite mugs and gave them spoons to enjoy it with. Everyone drank it up. Bone broth has long been revered by cultures all over the world for thousands of years. These cultures have recognized its many health benefits, as well as its ability to help cooks make use of the entire animal. This way of living provided for very little waste, and also presented dozens of health benefits. All of these minerals are found in food, and all of these are found in bone broth – no need to run to the health foods store for a vitamin supplement. Best yet, these nutrients occur naturally in bone broth in a form that is easy for your body to absorb. Let’s take a look at some of the amazing health benefits of bone broth, shall we? Immune system booster – Bone broth is full of amino acids such as arginine, glutamine, and cysteine. These acids have been shown to improve the function of the immune system in both people and pets. Relieves symptoms of the common cold and bronchial ailments – A 2000 study was published in the official Journal of the American College of Chest Physicians that proved reaching for bone broth does indeed help subside symptoms of colds and coughs by thinning out mucus, clearing respiratory pathways, and being easily digested. Additionally, Irwin Ziment MD and UCLA professor, determined that bone broth contains loads of cysteine, which is chemically similar to a popular prescribed bronchitis medication. Anti-inflammatory properties – Due to the high concentration of amino acids that are present in bone broth help reduce gut inflammation. According to an article in Chest from October of 2000, having a well-balanced gut free from inflammation can help reduce symptoms of the common cold. Promotes healthy teeth and bones – In order for your teeth to and bones to develop properly you need an adequate and consistent flow of nutrients entering your body. Bone broth contains a slew of these vital nutrients like calcium, manganese, and vitamin C.
Weight loss – In a nutshell, bone broth contains high levels of L-glutamine which is an essential amino acid and has been found to reduce Firmicutes in the gut. Firmicutes is a type of bacteria that is more prevalent in the guts of obsess people. Bone broth can help decrease this bacteria and aid in weight loss. Keeps you hydrated – Studies have shown that bone broth can actually rehydrate you better than water alone. Wouldn’t it be funny to see football players on TV trading their Gatorade for bone broth? Enhances your workout – Bone broth is wonderful for drinking after a workout and restoring the electrolytes that you lost during the process. Strong muscle builder – Amino acids in bone broth have been known to stimulate muscle protein synthesis. Better moods – Bone broth is extremely nourishing to the gut microbiome, as previously stated throughout this article. When your gut is out of whack so are your emotions. Consistently drinking bone broth can help keep your moods in check. Gelatin – Bone broth contains gelatin and with gelatin comes a whole host of health benefits including healthy nails, youthful looking skin, anti-tumor, arthritic pain relief, protects your cells, supports healthy blood sugar levels, fights insomnia, helps regulate bleeding, and balances the production of stomach acid. For more, please see this article. Wow! Talk about a host of benefits coming from bone broth! And to think, I thought bone broth was only good for colds and the flu when my friend had first told me about it. Are you ready to reap the benefits of consuming bone broth? Let’s get to the recipe and canning instructions! As with anything, the main difference between store-bought and homemade bone broth is that you know exactly what has gone into your homemade version. Bone broth doesn’t require many ingredients or much know-how to make, but when you look at the ingredients list on the packaging of the store-bought variety, you will see quite a few things that you won’t recognize – or even know how to pronounce. In addition to many store-bought versions containing preservatives and flavorings, you can also never be quite certain of where the bones came from. Ideally, you want your bones to be from pasture-raised animals, as well as those that are hormone and antibiotic-free. This is hard to find in a ready-made bone broth. In terms of quality, many store-bought brands of bone broth do not contain even nearly the same amount of nutrients as homemade versions. Plus, they are rarely as tasty! While there’s nothing wrong with using a quality store-bought bone broth when you really are in a pinch, you can make bone broth with just two ingredients (water and bones) right at home. Bone broth does not take long to make, so in most cases you are better off making your own and preserving it for future use. If you have a local butcher that processes grass-fed meat, then you are in luck. 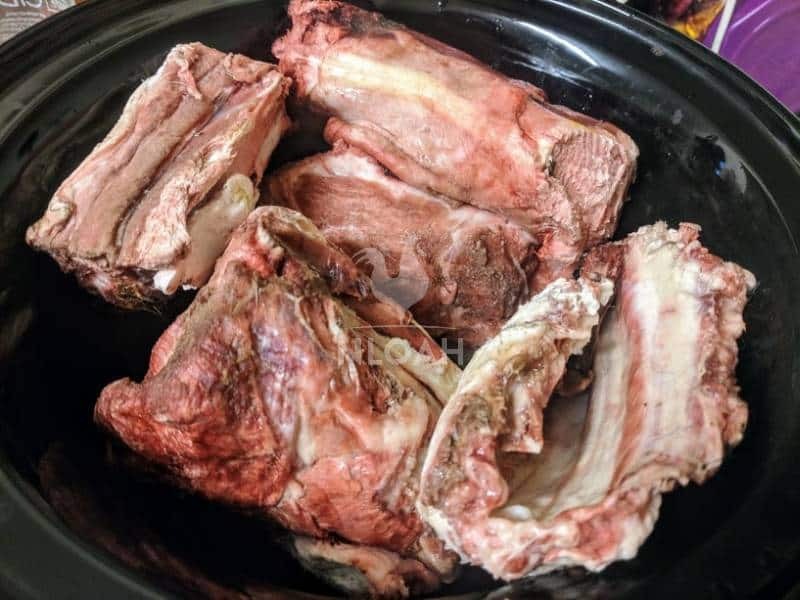 The majority of customers do not want bones when buying meat, and so not only are these discarded, but many butchers have to pay for the bones to be hauled away. This means that they tend to be extremely generous with giving away free bones of various animals to customers who want them. Of course, while grass-fed bones will be more nutritious, there is no reason why you cannot use bones from animals that have been raised in other ways. Speak to the butchers and farmers around you to see what you can find. If you raise animals yourself, make sure you save the bones after butchering to boil down into broth. For those who only have access to large-scale, department-style grocery stores, many offer bones in the frozen section. These can be pricy, but there are also plenty of options to be found online. If you eat meat on a regular basis, then this is another source of bones for you. 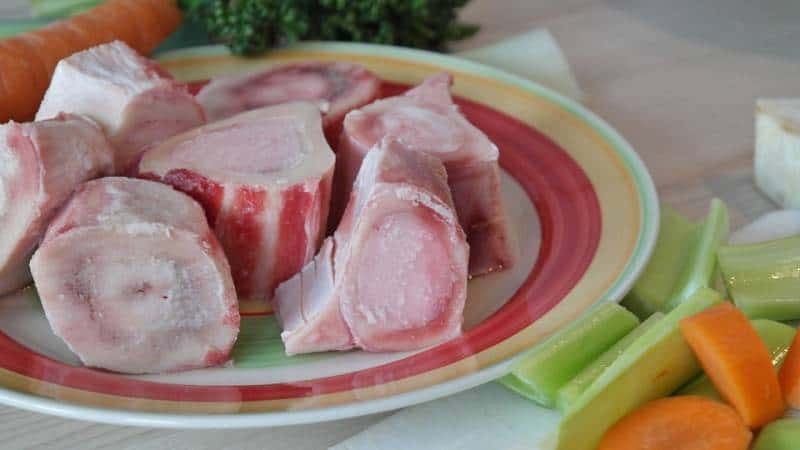 Simply save leftover or unused bones from your meals, keeping them in a bag in a freezer, and then use them to make a broth once you have collected enough. You do not even have to defrost the bones before using them, as you can just put frozen bones into your pot. Simply cook them on a higher heat for the first hour. You can make bone broth from any type of bone, but if you want your final bone broth to gel when it has cooled, rather than remain a liquid, there are a few rules that you need to follow. Joint Bones – these contain joints, and are rich in cartilage and connective tissues. They include feet, wings, necks, knuckles and tails. For your bone broth to gel, you need more than half of your bone content to be made up of joint bones, as these contain the connective tissues that break down into gelatin. The age of the animal that your bones have come from will also make a bit of difference in the final outcome of your broth. For example, a younger animal, such as lamb or veal, will have much more gelatin in their bones, whereas an older animal, such as beef, will have more minerals, as these will have accumulated over the animal’s lifetime. If possible, you should also try to cut your bones down, or have them cut down by someone else, into considerably smaller pieces. This will give them a higher surface area, meaning that more nutrients will be able to leach out into your broth. Smaller pieces will also mean that you will be able to pack more bones into the broth when cooking. There is absolutely nothing wrong with using bones from various animals, such as chicken, beef and lamb, and this will often result in a more flavorful broth. One final tip when it comes to your bones – many people choose to roast them in the oven first, as this adds some extra flavor, as well as a rich dark color, to the broth. While this can be done on the stovetop, it is easier to do in the oven. This allows you to de-glaze the pan once the bones have roasted so that you can scrape all of the delicious caramelized residue into your broth. You do not need to add in any extras when it comes to your bone broth, but there are some herbs and spices that can really add a new depth of flavor to your broth, while providing it with a few extra health benefits. Ginger – this spice has soothing, anti-inflammatory properties . Garlic – rich in antioxidants, garlic reduces oxidative damage and slows down the aging process. It has been used medicinally for centuries. Turmeric – an anti-inflammatory that also slows the formation of fatty tissue, helping with weight control. Make sure to include black pepper if you are adding turmeric, because the piperine in freshly ground black pepper allows the turmeric to be more easily absorbed by the body. Cumin – helps with digestion and with producing energy. Star Anise – has anti-inflammatory, antifungal and antioxidant properties, while also supporting digestion. Mint – aids in digestion and freshens the breath. Oregano – extremely high in antioxidants, and often used medicinally. Many people also throw a few vegetable scraps into their bone broths, whether this may be onion peels, chunks of tomato or bits of carrot. While these vegetables will impart extra flavor into your bone broth, make sure that you do not add in anything from the brassica family (such as cabbage), as this will make your bone broth taste bitter. Bone broth is extremely easy to make, and does not actually require much of a recipe, especially if you like to experiment in the kitchen. All you need to do is place your chosen bones into a pot, cover them with water, and cook it on a low heat until the bones have broken down. This usually takes around 24 hours, but can take longer or shorter depending on the bones that you have used. Adding in some vinegar is also a good idea, as this helps to draw all of the minerals out of the bones, and into your broth. While this is not essential, it helps if you want your broth to set. Apple cider vinegar is the best option, offering a variety of health benefits, but just about any vinegar will work. Using a slow cooker is one of the easiest ways to make bone broth, as you can leave it to simmer away for a couple of days without having to touch it at all. Place the bones, vegetables and herbs into your slow cooker. Fill the slow cooker with water, so that the bones are covered. Add in a pinch of salt, then add the vinegar. Cook on low for about 24 hours. Once your broth is ready, strain it and leave to cool before packaging, canning, or freezing. One of the benefits to using a slow cooker to make bone broth is that this method allows you to make a perpetual broth. This basically means that you have a pot of bone broth constantly on the go in your slow cooker, and simply take from it the amount that you need each time. When you do take some out, make sure that you top up your slow cooker with extra water. You can do this for about three to five days. After this period, you will need to remove all the bones and broth and start a new batch. This is also a good time to clean the slow cooker, as it can build up residue. This is perfect if you have been feeling ill, and need a constant supply of hot bone broth to help speed your recovery. 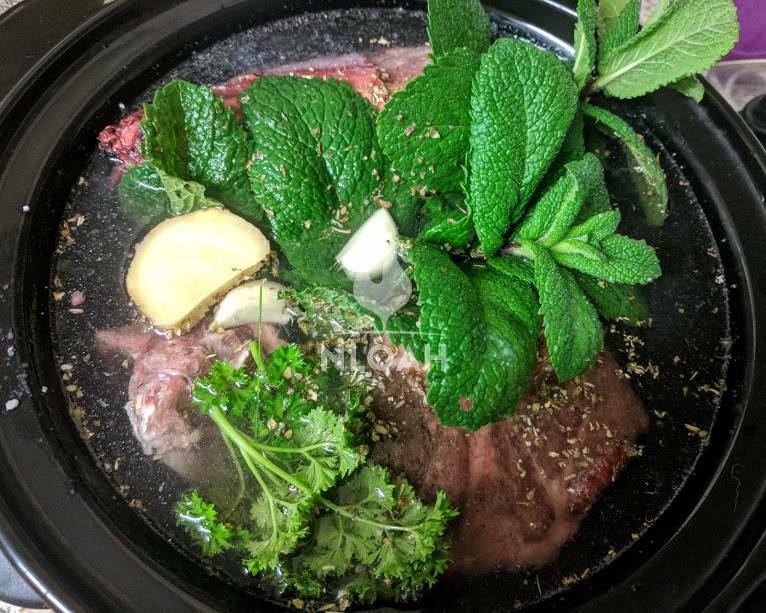 Using a pressure cooker to cook your bone broth does away with so much of the cooking time, meaning that you will have your finished broth much sooner. This is the perfect method for emergency situations. Place your vegetables and the bones into the pressure cooker. Lock the lid and then set the cooker to high pressure, placing the pot on a burner that has been set to a high heat. Once the high pressure has been reached, lower the temperature to the lowest possible setting. Set a timer for 30 minutes, or for up to an hour if you are using larger bones. Once the time is up, take the pot off the heat and allow the pressure to naturally release, which should not take longer than 15 minutes. Remove the lid and strain the broth. Place the bones, vegetables, herbs, vinegar and salt into a pot. Add enough water to cover the bones, and then bring it all to a boil. Skim the scum off the surface of your broth. Once at a rolling boil, reduce the heat down to a simmer and cover. Cook for around 24 hours. Add in some extra parsley during the last ten minutes of cooking for extra minerals and flavor (if desired). Take the broth off the heat and leave to cool before straining. Many people do not feel comfortable leaving a pot of broth cooking on their stovetop overnight, as this can be quite hazardous. If you would rather not do this, there is nothing wrong with turning the heat off before you go to bed, leaving the broth to sit in the pot overnight, and then turning it back on the next morning. Put your bones in the Crock Pot. If you find that your Crock Pot isn’t big enough to accommodate the bones, you can opt to use an electric roaster. As you chop your veggies, leave the peelings on them for added nutrition and vitamins. Know that all of the vitamins and nutrition of the vegies are going to be leached out into your broth, making it a high-nutritious food. Fill your Crock Pot or roaster with water and add in the salt. Add the apple cider vinegar. Adding vinegar to the stock is said to encourage the extraction of gelatin and nutrients from the bones. Don’t worry, it won’t effect the flavor of your stock. Allow the broth to simmer on the low setting for no less than 24 hours and no more than 72. Once cooked, strain the broth using a mesh sieve or cheesecloth. Many folks skim the layer of fat off the top of the bone broth once it has cooled. I do not do this. The fat is highly nourishing for the body and extremely satiating. Do you have eggs shells laying around? Toss them into the Crock Pot with the broth for added minerals. You’ll be straining everything at the end, anyway. Another option that you have is using your oven to make a batch of bone broth. First, place all of your ingredients into a cast iron or stainless steel pot, bringing this to a boil on the stove. Then, cover it with a lid and pace it into an oven that has been preheated to around 100 degrees Celsius, although you can feel free to experiment with different temperatures, as long as you keep them low. Leave your broth simmering away in the oven, adjusting the heat as necessary, until it has cooked. You need to ensure that the pot you use has a lid that is both tight fitting as well as heatproof, as this will prevent the broth from evaporating as it cooks. Once you have strained your bone broth, you will be left with the cooked down bones, as well as any vegetables that you have used. All of this will be extremely soft by now. Since these leftovers have been cooked for so long, it does not really contain many nutrients. 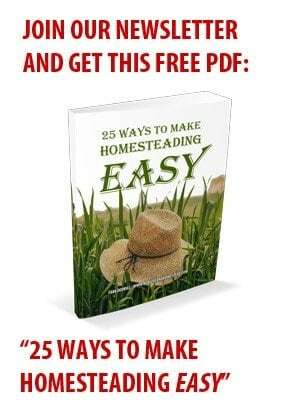 Your compost bin is a great place for this to go. 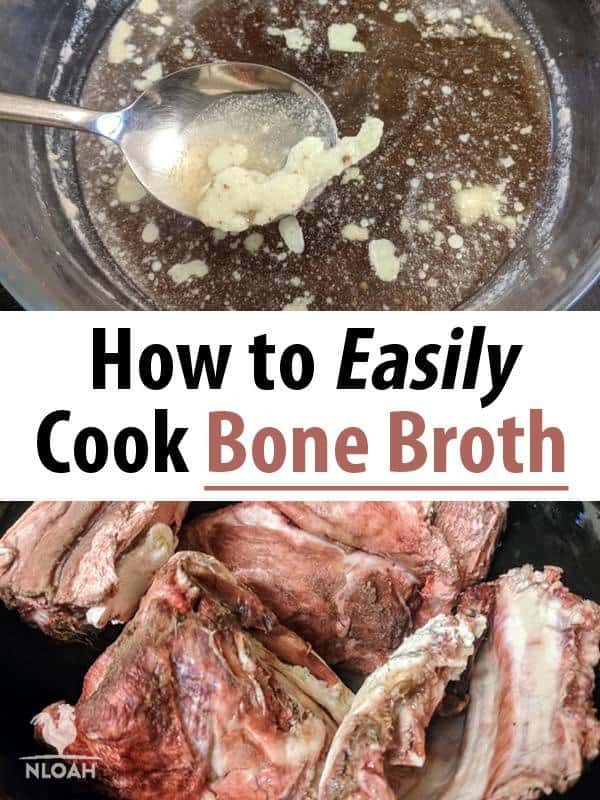 Alternatively, if you have used larger, harder bones, such as beef bones, and these have not fully broken down yet, you could use them to make a second batch of broth. However, keep in mind that the flavor of this batch will be much lighter than your first. Another option, if you have pets, is to blend all of the soft bones and vegetables together so that it forms a paste. You can then use this as a filling for treat toys, or even dehydrate them and turn them into small pet snacks. However, you can only do this if your broth does not contain any ingredients that would be harmful to your pets, such as onions. Bone broth can be stored in the refrigerator, in an airtight container, for up to a week. After it has been refrigerated for a few hours, you may notice that a thick layer of white fat has formed over the top. This is perfectly normal, and you can simply spoon the fat off and use this elsewhere in the kitchen. If you would like a clearer broth, you can strain it again through a cheesecloth. Bone broth can also be frozen, either in resealable bags, other plastic containers. You can even use ice cube trays for easy access. 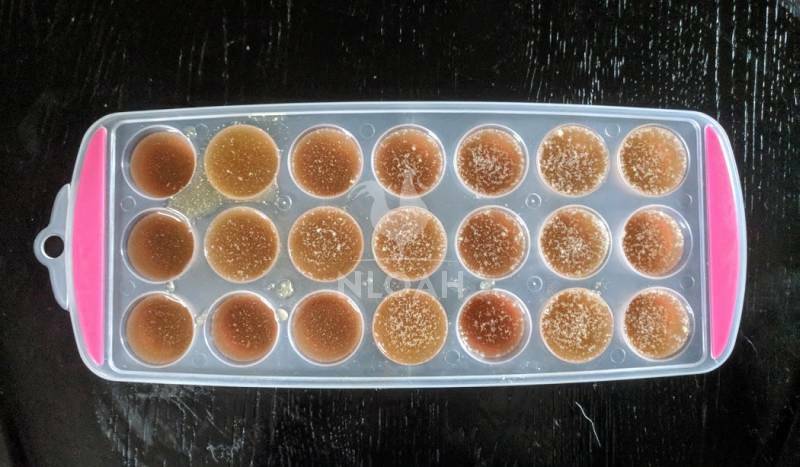 When frozen, bone broth will keep for up to six months. Another option is to turn it into a powder. To do this, you should first cook it down to reduce it until it turns into a thick syrup. Then, spread this concentrated broth onto sheets in a dehydrator, drying them until the sheets become brittle. Break these sheets up and put the pieces into a blender, processing them until they form a powder. This can then be added to different foods for extra flavor and a boost of nutrients. Finally, bone broth can be canned using a pressure canner. Never try to can bone broth using a water bath canner, like you might use to can pickles, as bone broth has low acidity and will spoil quickly. At the end of the cooking period for your bone broth, strain the hot broth into sterilized jars, leaving about 1 inch of headspace. Actually, if you are canning the broth, it is a good idea to bring it to a boil right before it has finished cooking. You want it nice and hot when putting it into the jars. Now, if you notice gelatin in your bone broth this is a good thing. Leave the gelatin there and can it up with the broth. Gelatin is a sign of great broth. Make sure you have your pressure canner heating up and ready to go. The key to canning success is to have the water hot and ready to receive your jars. Place lids and rings on the jars and put them into the pressure canner. Process pints at 10 pounds of pressure for 20 minutes or 25 minutes and 10 pounds of pressure for quart jars. If you live in a high-altitude area, refer to the pressure canner owner’s manual for instructions. This is an important step because different altitudes will change the processing times of your jars. This is a key safety feature. Once the jars have processed, remove them from the canner and allow to completely cool. I enjoy placing my jars on a rack while in the canner and pulling them all out at once. If you do not have a rack you can use a simple jar grabber. Listen for the joyous sound of popping lids. If after 24-hours you do not hear your lids popping, press down on them with your finger. If the lid pops up and down the jar has not sealed and you must repeat the canning process with a new lid or place the bone broth in the fridge and use it within a week. Non-sealed jars are not shelf-stable. Now you know how to make and preserve bone broth plus all the benefits of this amazingly nourishing “soup”. Many people love the taste of bone broth on its own, and drink a cup of this first thing in the morning or for an energy boost in the afternoon. Use it in any recipe that requires a stock. Use it as a base for soups and stews, for extra flavor and nutrition. Boil rice or pasta in it. Add a splash to mashed potatoes. When cooking beans, replace some of the water with bone broth. Dehydrate it to make a broth powder. Mix it into a marinade. Add some to poached or scrambled eggs for a meaty flavor. Mix it into some tomato sauce. Turn it into a dip or a pate. The health benefits that bone broth brings to humans are just as powerful as those that it brings to other animals, such as your beloved pets. Whether you have dogs or cats, bone broth not only makes a tasty and healthy treat, but is also a great pick-me-up. If you give your dogs marrow or soup bones to chew on, you can take any leftovers from those and also turn them into a broth. If your pet is feeling under-the-weather, and has been advised to stay off food for a while, bone broth is a way to ensure that they are still consuming the nutrients necessary to help with the healing process. It is also commonly used to prevent dehydration in sick pets, as well as to act as a meal topper for picky pets, as the meaty smell tends to be enough to tempt even the fussiest of eaters. Added herbs can also give a health boost to your pets. However, when making bone broth for your pets, you do need to be careful that you are only using ingredients that are safe for them to consume. Make sure that you never use onions or salt, and, if you are using any herbs or spices, check that these are safe for animals. Whether you make it for your pets or yourself, bone broth is such a nutritious food, and makes use of ingredients that would likely have otherwise gone to waste. If you have any favorite bone broth recipes, let us know in the comments section below! Comprehensive & well written! Only thing I don’t agree with is putting residue in compost pile; it would certainly attract “critters”. How long to you recommend pressure canning pint jars of broth? I’ve been canning my own bone broth for many years. I process it at 15lbs of pressure for 75 minutes for quart jars and 60 minutes for pint jars. I’m in Austin, TX and pretty close to sea level. I have been able to keep jars for 2 years this way with no noticeable change in flavor. Just remember to remove the rings when the jars have cooled and sealed. If a lid pops, throw it away. It’s not worth the risk of getting sick.